If you’ve spent any time on Instagram or YouTube in the last few months, you’ve come across an “unboxing” video. This refers to a video featuring someone opening a box, package, or envelope and reacting to what’s inside (usually in a positive way). Whether it’s unboxing a meal kit delivery service such as Hello Fresh, a techie unwrapping the latest iPhone, or a child unpackaging Peppa Pig on YouTube, this trend is everywhere on social media. The fact that it’s become so popular so quickly tells us one thing: it’s working. It’s a great marketing strategy that resonates with millennials, since it meets at the intersection of great branding and authentic customer delight. 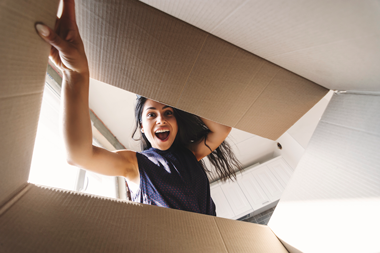 Even if your business is not leveraging an influencer marketing strategy this doesn’t mean you can’t participate in this fun unboxing trend. The very act of “opening something” is having a moment right now and leaning into this social media staple will help position your business as in-the-know and on the cutting edge. By focusing on giving your customers a fun and memorable opening experience, you’re more likely to stay on their mind in a positive light. One of the keys to having people feel delighted by the mail opening experience is by making it visually appealing. There are plenty of ways to make opening your mailpiece fun; whether it’s size, shape, material, unexpected inserts (and more!). This may not seem like breaking news (of course you want the mail you send to look good) but focus on making your pieces especially camera-friendly: bright colors, crisp lines, interesting illustrations. Aim to delight from the start. Whether it’s including a sensor that starts playing a jingle upon opening the card, or even filling the envelope with a few pieces of paper confetti, the idea is to make the experience feel unique and in turn memorable. Be sure, however, that the gimmick is relevant to the message. The message should be creatively enhanced that through a tactile experience — not exploited or forgotten by one. In need of inspiration or know-how when it comes to direct mail or packaging? Ask the experts at Digital Dog Direct. Contact us today.